There are many financial terms in Project Management. They are mostly related to project selection methods and especially to the most common approach for project selection which is the economic model. If you know these financial terms well as a project manager, you will be more confident about choosing the right project. 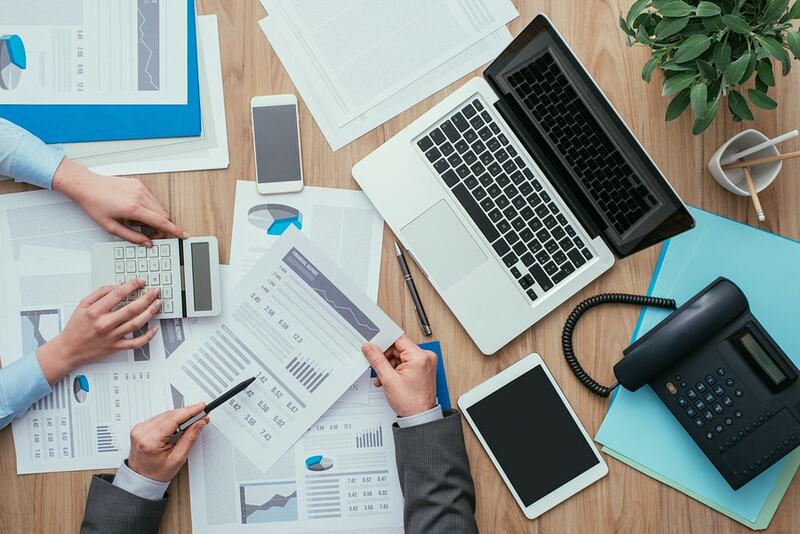 Because these financial terms will help you better calculate the cost, the profit and all the other crucial aspects of the projects to be initiated. 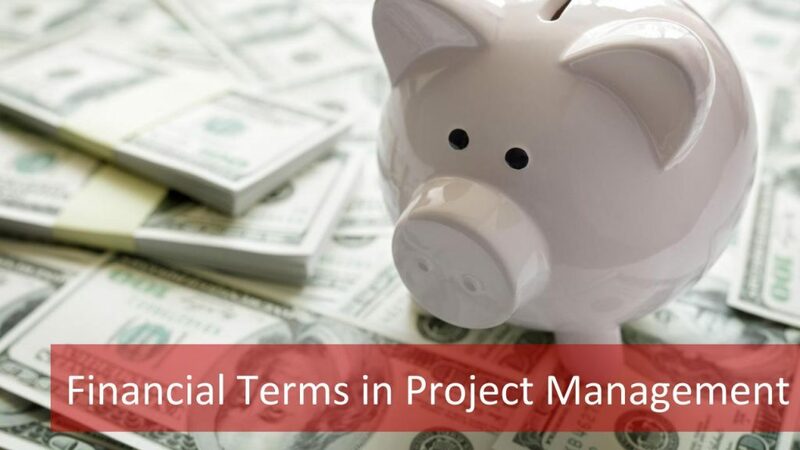 As defined in PMP training, these financial terms are about project finance and in this article, we are going to review six of these financial terms. To obtain a more thorough knowledge of these financial terms, check the online PMP training options to enroll in a PMP certification training. Now let’s define these six financial terms and illustrate them with examples. First one of the financial terms is the Economic value added and it’s abbreviated as EVA. EVA is concerned with whether the project returns to the company more than its costs. Let’s give an example for this one of the important financial terms. If the project costs for $100,000 and if the company will have benefits that will have a value of $120,000, then the economic value added for this project will be $20,000. EVA is the amount of added value the project produces for the company’s shareholders above the cost of the project. Note that, this added value might be either financial or intangible assets. You can run a marketing campaign that will increase the brand awareness of your company. Although it might not directly bring revenue to the company, it might increase the brand value. Therefore, it will be considered as economic value added as well. Opportunity cost is one of the important financial terms that is related to project selection. Opportunity cost is the opportunity given up by selecting one project over another. There might be several projects that an organization can initiate. But due to some project constraints such as budget, schedule, resource constraints etc. some projects are selected over another. Let’s consider that there are 2 projects in your organization that the management is considering to initiate. 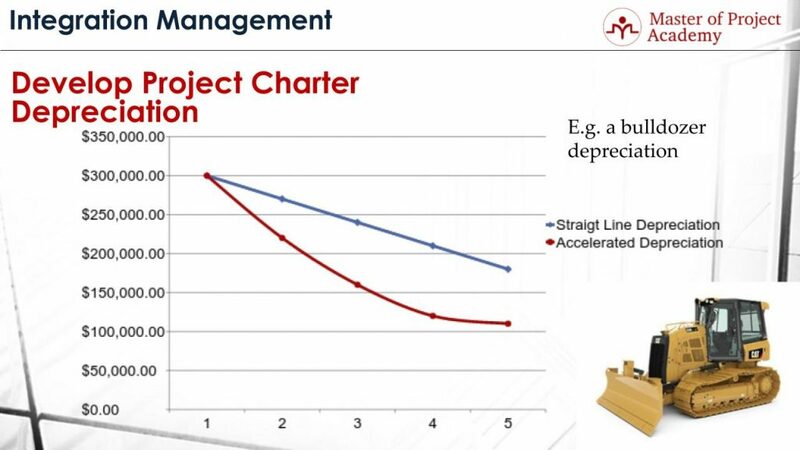 Net present value of project A is $200,000 and net present value of Project B is $150,000. Both projects can be initiated because they both generate positive Net Present Values. However, if only one of these projects would be selected, Project A looks more reasonable since it will bring higher net present value. If Project A is selected, then the opportunity cost of selecting Project A is $150,000. 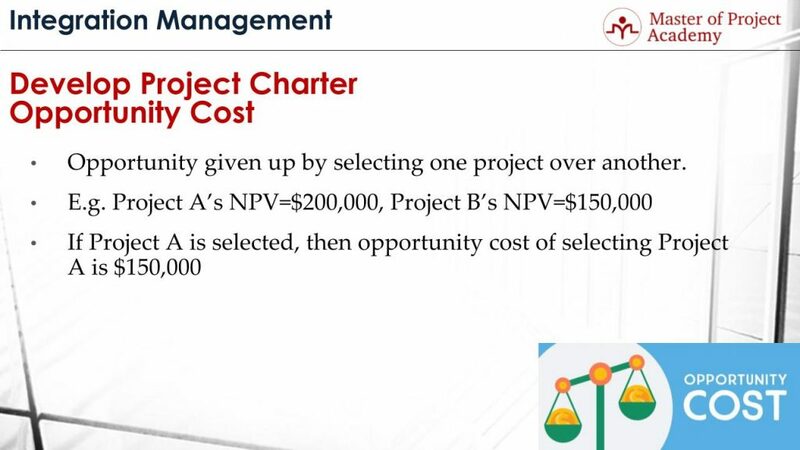 Because, by selecting project A, Project B will not be initiated and therefore the net present value of $150,000 that would have been gained with project B will not be gained. Another one of the financial terms is the Sunk costs, which are expended costs. At a point during the project, sunk costs represent all money that has been spent till now in the project. For instance, if there has been spent $100,000 till now in the project, this is sunk cost. Sunk costs are not considered when deciding whether to continue a troubled project. Because that is the money that has been spent already. For instance, the project might have spent $200,000 while it was planned to be spent $100,000 for the work that has been accomplished till now. This is a big variance. Senior management of the company might evaluate to terminate this project due to this cost variance. But when considering termination, $200,000 spent already might not be taken into account. Because it’s gone already. If the future works starting from now will bring benefits to the company, the project can be continued. The most common way of increasing the productivity is increasing resources. For instance, two workers paint a house faster than one worker. Or, two machines can produce more products than one machine. However, the law of diminishing returns proposes that after a certain point, adding more input or resources will not produce a proportional increase in productivity. The main reason of this might be due to extra coordination. If two workers will paint the house, they need to do the work in a coordinated way. At some parts, they might intersect in same locations and this might affect their productivity. Let’s go over an example to understand the law of diminishing returns better. Think of a construction project. At the first column, you see the number of construction workers increasing in each step. The second column shows the constructed area per day, and the third column shows average constructed area per day. 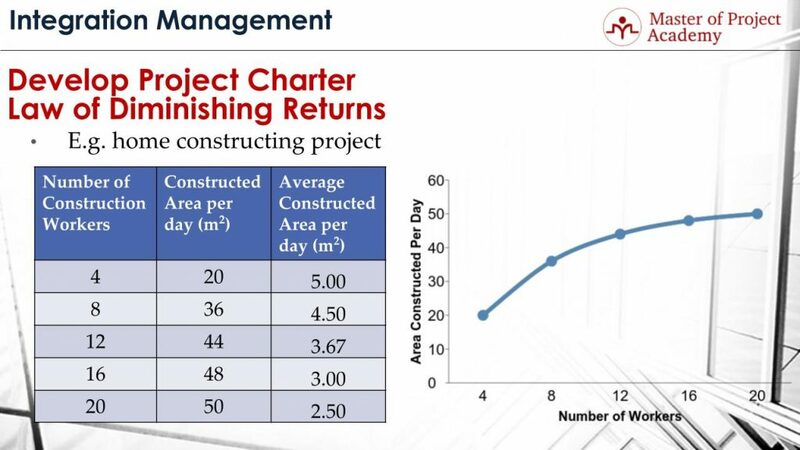 As you see, constructed area per day increases, with the number of construction workers increases as well. But average constructed area per day decreases because there might be coordination issues and there might be management issues that you should consider when working with a higher number of workers. In the graph, on the right side, you see that there is not a linear increase of the area constructed per day while the number of workers increases. It bends over time when the number of workers increases. Working capital is one of the important financial terms, which is calculated by current assets minus current liabilities for an organization. This is used as the amount of money available to invest for a company. Assets include the liquid money, properties, shares, and any other investment instrument that can be used. Liabilities are actually debts of the company. These can be rental fees, payments to the suppliers, salaries that will be paid to the employees etc. Another one of the financial terms is depreciation. Large assets, for example, equipment, vehicles purchased by a company, lose value over time. For instance, let’s think you bought a brand new car now. Will it have the same value after you use it for five years? Of course not. The value of the car will decrease during the time and this is called depreciation. This is an example of depreciation. In order to calculate the current assets of a company, depreciation is taken into account. Because, a tool, vehicle, equipment etc. that will be purchased now will not be able to be sold with the same value after some time. Straight Line Depreciation: It is assumed that same amount of depreciation will happen in each year or each period. Accelerated Depreciation: Value of the tool, equipment etc. depreciates faster than a straight line. Depreciation is higher during the first years or periods in accelerated depreciation. Let’s see the two types of depreciation over an example. Let’s assume that your company purchased a bulldozer in order to use in construction projects. Purchasing amount is $300,000. This bulldozer will lose its value over time. This figure shows how depreciation will happen in straight-line and accelerated depreciation models. The blue line represents the straight-line depreciation. Each year, $30,000 is depreciated from the value of the bulldozer. Red line represents the accelerated depreciation. The depreciation is higher during first years and lower in last years. Depreciation amount is $80,000, $60,000, $40,000 and $10,000 respectively. Financial terms in project management are important for a strong project management process. These financial terms will help you to manage the budget, or when you are choosing a project. So if you understand these financial terms, the chance of the project’s success will increase significantly.